hello again! 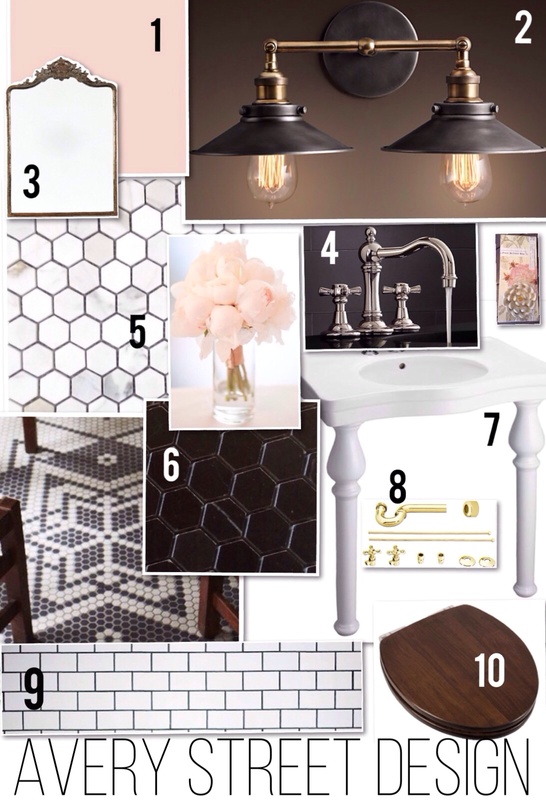 after pouring over about a billion inspiration photos and doing an unhealthy amount of online shopping, i'm excited to introduce you to my powder room design board! 5 // floor tile // calacatta marble 1" hexagon // $16 per sq. ft.
6 // floor tile // black marble 1" hexagon // $16 per sq. ft.
9 // wall tile // calacatta gold marble subway tile // $18 per sq. ft.
this was soo fun to put together. next challenge: find a way to bring this soaring budget down out of the rafters. if you're quick at math, you already know this design eclipses the $3000 mark. that's triple what we have to spend. so. now that i have a plan, it's time to get creative. i know there are going to be ways to achieve this look for less. i'll keep you posted!